Today is a prepare-to-move day. I gather up our bedding and dirty clothes and drive us down to the laundromat. Clean laundry will give us a fresh start at our new camp. Bridget and Spike recognize the place and are happy to go for a walk around the premises. Back at the campsite, I put the outdoor items into the PTV. The charcoal grill gets a cleaning so it can be loaded, too. I gather up some kindling sticks to place in a pile next to the fire ring, along with a few pieces of firewood I bought before going to Quartzsite. It’s a good habit to leave a site in a welcoming state for the next camper. It may seem odd for me to say this. After camping here at Darby Well for several weeks, I’m reluctant to leave. The weather is perfect and the air always smells clean. There’s a lovely view in every direction. The sunsets vary from serene to glorious. Lately, every time the crew and I go exploring, we discover new flowers. Tiny, daisy-like flowers smaller than a dime dot the rocky ground like fresh snowflakes refusing to melt. Hundreds pop up in an area the size of a blanket, and these blankets of mini-daisies are all over. This afternoon we find some lavender ones. I’d love to see the saguaros when they don their flower hats. Oh well. Maybe next year. It’s time for us to get moving again. After giving them plenty of time to set up, I see them moving around outside their Casita Spirit, so the crew and I walk up to welcome them to the neighborhood. Linda and Allen are here from camping for four days in Puerto Penasco, Mexico, right on the beach for $5 a night. Sweet! They’re friends of people who have been camping here at Darby Well for several weeks. I’ll break camp in the morning. In Ajo I’ll gas up and get propane. Instead of dumping waste tanks at Belly Acres RV Park for $10, I’ll go north and stop in Gila Bend. I’ve heard about a Shell station there that allows free dumps. I’m always looking to save money! I’m not sure where we’ll make our next camp. "Oh, no! You and the crew are leaving?" I have two boondocking sites in mind. I’m tempted to camp near Casa Grande so I can make a run to Wal-Mart. Or I might go further north. I’ll decide tomorrow. It’ll be fun to get back on the road! Hover your cursor over the wise old saguaro for an important message to fulltime boondockers! This entry was posted in Simple living and tagged Ajo, Arizona, boondocking, camping, casita, saquaro. Bookmark the permalink. 62 Responses to Goodbye, Darby Well! When I’m out camping, it seems I get to be a part of a place and am often reluctant to leave. But the good thing is, after awhile, you get a retinue of such places and can return to them, sometimes even a year or so later, but it’s like a second home (or third or fourth etc.). That’s the beauty of boondocking, the whole world (in a fasion) becomes home. I’m beginning to understand exactly what you mean, Chinle! It’s another wonderful dimension of boondocking I didn’t anticipate. I’m establishing homes all over! I actually felt more attached to Darby Well when I left today, than when I left my home in Georgia in which I lived for close to two decades! I guess the difference is I enjoyed every minute at Darby, whereas I was in the rat race when living in my former house. Looking forward to your new adventures! Amazing place, that desert! Seems to grab your heart and soul ! Stay safe! You described it perfectly, Geri! Safe and happy trails… catch you on the flip side. Thanks, Bob. I’m on the flip side as I write this and will post about it tomorrow. Thanks again for these posts. Always inspiring and interesting to read. Love the comments on the photos! You’re welcome, Mary. You can’t imagine some of the silly statements that almost made it behind the cactus photo! Just wondering how you would have responded had the new neighbors meandered down to your camp. You broke your own rule by visiting another campsite uninvited. But as you will learn as time passes, that’s what RV’ers do. They just happen by for a visit and socialize. Look’n forward to your next camp. Billy Bob, you sure like to set rules don’t you? These folks were: #1 set up and #2 outside and moving around and #3 have the same type of trailer that Sue does.Most all Casita folk I know ( I’ve had 2 and an Oliver) welcome people AFTER they are: #1 set up and #2 moving around outside. That’s okay, Billy Bob. I anticipated a comment such as yours and I understand why you would make it. The points that Chuck made explain why and when it’s appropriate to visit another campsite uninvited. In addition to the three reasons stated above, Linda and Allen were my neighbors and it’s only polite to say hello and see if they needed anything. If I didn’t say hello, Spike would have anyway! I made sure they saw me on my way up the hill so there was no surprise and I kept my visit very brief. I think the misunderstanding comes from not distinguishing between RVing and boondocking. When I’m RVing, which is a more communal activity, dropping in on each other is natural and fun. A boondocker off on a lane, isolated in the desert, is different, and then there’s the solo female perspective to consider. No hard feelings on your comment. I hope I’ve made the distinction clearer. I did get a free dump today at the Shell station I mentioned in the post. I’ll keep Flying J and Pilot in mind in the future. Thanks for reminding me! For shame on ya bearwise. You’re not an RV’er are ya? RVing is all about visiting and socializing with other RV’ers. There’s no way of getting around it no matter what rules you make or where you try to hide. This is something that Sue has yet to learn, especially with her popularity. I’ll continue to read her blog and hope to someday meander into her camp for a good cup ‘o and some lip flapp’n. We ARE RV’rs and I think it’s time to let that subject die on the vine… Don’t you BillyBob? Just one more word on this that you fellers seem to have missed. Sue is a lady travleing SOLO. That means ALONE. Strangers seeking you out can be scary. Her new neighbors (plural) saw her coming and didn’t run away! It’s different than when a guy goes solo. ‘Nuff said on the subject! I’m at my new camp and if wordpress or my computer don’t stage a strike like a few days ago, I’ll tell you all about it tomorrow. I can hardly wait to tell you about it! Can’t wait Sue to hear and see the pics.. Stay in the sun.. always ..
You can find joy where ever the trail takes you. And on this particular trail at this juncture in my life, joy comes easy! I love your comment. Bob! You got me giggling. I feel sad you are leaving also. That place seems to transend cyber space with its beauty but I am sure there is more magic just around the corner for you and the crew. We found some more magic today! I’m taking photos and putting together a post for tomorrow. Puerto Penasco, Mexico! I would love to do some of our trips to Mexico. A little scary though with all the happenings on the border right now. Hats off to Linda and Allen! Glad to hear my blog is worth your time. You are fortunate to have a Casita already that you can practice camping in. Enjoy! I’d love to go to Mexico, too, and maybe I will someday. Right now there’s lots for the crew and me to explore in the U.S.
Linda and Allen aren’t retired yet. They love their Casita and the places it can take them. Hi Sue….I’m finally getting around to asking you what kind of camera/lens you used for the bird photos several posts ago? Wonderful photos…. I didn’t take the bird photos. At the end of the post, underneath my name, there is a link to the natural history site where I got them. My little Sanyo digital would have a hard time catching those beautiful shots. The only bird photo I can take credit for is the one in today’s post! Enjoy the move. Darby Well will be waiting for you when you return again. Thanks, Page. I’ll be back, God willing. I’m sorry you are moving too. I have so enjoyed the solitude and the calmness of your posts from Darby. Are you sure you really want to go or is that you feel you should? Of course anywhere you go will be wonderful and I know you will pick places that suit your joy in nature and solitude. Contrary to some, as a full time RVer, I don’t feel RVing is all about being social and visiting. I do very little of that. I think it’s all about living your life the way you want to. There is no prescribed way to RV. Sherry! I’ve found a great campsite! I’ll be posting tomorrow . . . gotta tell someone about it! You have important decisions to make, and it’s good you are considering your options carefully. Of course, I’m a proponent of travelling light. In other words, nothing tethering me to one place, not even a storage locker! Selling my house was like pushing my boat from the shore . . . a great feeling of freedom, no more house maintenance! Only one reminder if you intend to fulltime in a Casita. There isn’t much storage space, and no matter how good you are at selling all, you’ll still have stuff you’ll want along with you. I don’t know how much space is in a Toyota 4Runner. The V8 engine is great! You are going to have a fantastic time, once you set yourself up in a way that suits you and tow your Casita on new adventures. Happy travels. I can’t wait for our mini adventures to begin in March. We just returned from picking up our Toad. We bought a Suzuki Samurai. Light enough for our small class C to two, giving us the ability to do some adventuring around camp without having to break camp each time. It made it 285 miles in heavy winds, so I think we got a good one. I am looking forward to hearing of your new home wherever it is you end up. The crew will be ready for new adventures, sights and smells. http://www.tripswithtwo.com/blog/. Sounds like you’ve got things set up for a lot of fun adventures! And March is right around the corner . . . I’m happy for you. Hi Sue, Glad to read your post, I have been missing you. I look forward to reading about your new adventures and the new pictures. If only I could travel like you…Enjoy…. I want to post every day. It was getting hard to come up with new stuff after being in one place a long time. Now I’m in a new location and the signal seems good, so I hope to keep up with my blogging. Once in a while, I have a terrible time trying to post photos . . . sometimes it takes almost an hour before one photo will post . . . I get frustrated and quit. Yes, I’m very fortunate to be able to travel like this. I’m really enjoying your posts about traveling in the desert. It’s also interesting to read the comments from other readers. I guess I was kind of surprised by the way chuck and geri jumped all over billybob. Why? He didn’t say anything rude or nasty, just stated his opinion politely. chuck and Geri might want to think about writing their own blogs so they can moderate the comments on their own blogs and let you handle yours. I think you can handle it on your own just like you handle your boondocking. Just a thought. I’m guessing you are not aware of the recent hullabaloo on this blog. It arose because I spelled out that I need my privacy and asked that people respect that by not looking for my location in order to drop in. Some harsh words were said at that time. The growing negativity led to my decision to delete two entries along with over 100 comments. Chuck and Geri are close, personal friends. It was upsetting for them to see me criticised publicly on this blog. When they saw I wasn’t defending myself, they –like good friends do– rushed to my defense. Understandably, when the topic came up again, they wanted to stop it. I love them for that. I hope this answers your question “Why?” Now let’s all gather round and sing Kumbaya! Marylou… we DO have our own blog, just click on my name. Thank you for caring about Sue! Looking forward to your next chapter! Can’t wait to share in your next adventure. What a cool idea to leave wood for the next folks that will enjoy the area….I guess this is something you learned along the way? Take care! I’ve had the habit, long before I started living in my camper, to always try to leave wherever I go in better shape than I found it. Sometimes it’s as simple as picking up some papers blowing across a parking lot of the grocery store and putting them in the trash. Rather that step over a discarded can, I pick it up. Not that I’m Miss Wonderful Person or think I deserve a medal . . . it’s the way I was brought up. Rick gave me the firewood idea. He left a neat stack of kindling and logs at his fire ring. Linda and Allen were so pleased to find it waiting for them! Sue, I don’t know if you have a program like PhotoShop or not, but if so, you can downsize your photos so they post quickly. Don’t need much resolution for the internet. You may have covered this somewhere else, but I’m curious what you use for your internet connect. Verizon aircard? Thanks so much for bringing this up! I’ve been wondering if my photos are slow appearing. I hate that. I’ll see what I can do. I was resizing the photos before I switched to the picasa photo editor. Now I need to figure out how to do that with picasa. I use a Verizon aircard… $35 a month, two-year contract, 3Gs a month. Sometimes I’m still taken aback when I realize the person I’m talking to is pushing a shopping cart or something while I’m wandering around the desert. Having cell phone and internet balances the solitude nicely. Conversations with a saguero. Words of wisdom. Safe travels. Looking forword to to hearing, or reading, about your next home for the day, month, ?. Preparations for the future residents of your former home? Who will it be? Wondering? With thoughtful anticipation of those who will be enjoying your wonderful home in the coming weeks. Hello, Bill and Ann . . .
I’ve been curious what route you took from Ajo back to Oregon. Sometime let me (and us) know, okay? I want to go to Oregon at some point and need to learn what roads are good. Hi Sue, I can understand why you were sad to leave that area. We only spent 2 nights there. Once on the way and once on the return trip from that same $5 beach in Rocky Point. Darby Wells is a perfect place to spend the night and break up the journey. Having lived in the Sonoran desert for 20-some years, I didn’t think I would be that impressed with the desert around Ajo but I have to say that it’s some of the most beautiful desert in the state. It’s so pristine and those Organ Pipes don’t grow naturally in all the desert areas. I can’t wait to return and I’m sure you can’t either. But now, I’m excited to see some photos of your new hide-out! You’re making me want to go to the beach! Oh, the Organ Pipes . . . I didn’t mention them at all, but they are a wonder, aren’t they. Ann (of Bill and Ann above) found what she named an “Organ Pipe Garden” when she and Bill hiked around the Darby Well Road area not long ago. I’m anxious to post about my new boondocking site, if I can ever get it done. Spike is so thrilled with his new home, he keeps insisting on walks! Sue, it must be a hard decision to pull up your roots and move on when you’re in such a delightful spot. As much as we love adventures, human beings seem to crave the familiar. I suppose that’s the joy of having your own little Casita…wherever you are, you are HOME! I can’t wait to see your new surroundings and all the joys you discover there. Enjoy! Her Airstream is for sale. If you want to know more about it, look for her comment at the end of comments for the previous post. Again, congratulations and best wishes! You are so sweet, Sue! Thank you for the congrats! We’re almost all moved in to WREN who sits in the RV park’s storage area waiting for us to start our Casita adventure. Another week and we’ll be off! Hello, Linda, and welcome to my blog! Good for you and may God bless you and your dream! I am so excited you are on the road again, going to the next new adventure! Let us know why you picked north, south, east or west of Darby Wells. 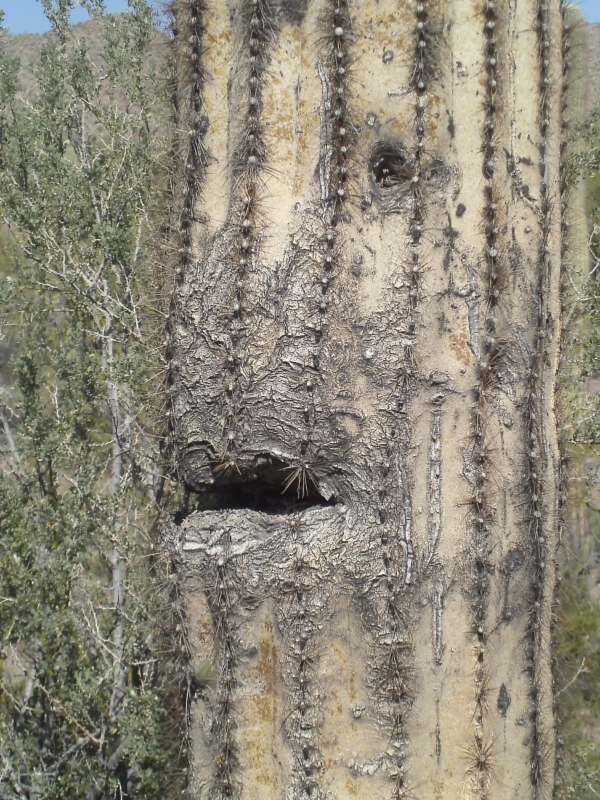 Oh, and that old cactus did look like a person, it needs a good spook tale so alot of little kids at night could be scared half out of their minds. Oh ho! As I reply to your comment, I’ve finished a rough draft of our move. I didn’t include why we moved where we did, but I’ll try to remember to do so in a future post . .. It’s a good idea! We were all set to join you, leased the farm, I retired. T,heh I had a stroke,and our fith wheel burned.It looks like we got enuff from ins to buy Casita,Will give your name as reference if we do.